According to the EPA, organic materials like food waste and yard trimmings account for almost 30% of all municipal solid waste in the U.S. While much of this waste is currently sent to landfills, handling it in a more sustainable manner can have a significant positive impact on the environment. Composting not only reduces the amount of food waste that is sent to landfills and water treatment facilities, but it also helps create nutrient-rich organic soils, which provide an alternative to artificial fertilizers. Additionally, compost can also be used to produce electricity by harnessing gases from organic decomposition. How does Composting Benefit Me? Composting can actually make your kitchen, apartment, or office space cleaner! Unpleasant odors in residential trash typically come from food items. By storing all your food and organic waste together instead of throwing it away, your trash can will be cleaner, smell better, and may not need to be emptied as often. If you're composting at Tufts or dropping off your compost on campus, you can compost all fruit and vegetable scraps, grains, coffee grounds, tea bags, eggshells, bleached or unbleached paper (like brown paper towels), human hair, and other organic material. Make sure not to put any meat or dairy products in the Tufts compost bins, as they can attract animals. For a comprehensive, printable poster of compostable and non-compostable items, click here. Not really. As long as you make sure to empty it regularly, compost bins typically don't smell any more than normal trash cans. 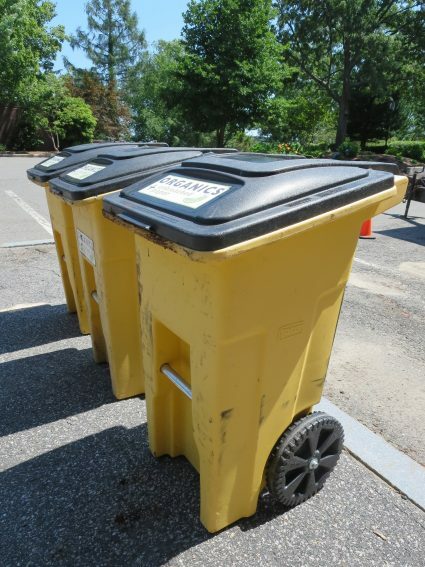 Some bins, such as those maintained by the Eco-Reps in campus dorms, include an activated carbon filter in the lid to help minimize any scents. If you're still worried about smelly compost, try storing your compost bin in the freezer to eliminate all odors, and make cleaning a breeze! Where Does Tufts' Compost Go? Tufts does not compost onsite. Instead, compost is sent to external locations where it is turned into a rich soil. One of these is Rocky Hill Farm in Saugus, MA, about 10 miles away from the Tufts Medford campus.